Pumpkin. Cornbread. Croutons. It reads more like a shopping list than a product. With Trader Joe’s Pumpkin Cornbread Croutons we have another strange and daring pumpkin offering. As a salad lover I was quick to pick these up. As any true salad connoisseur knows, the combination of textures in a salad is almost as important as the combination of tastes. The simple addition of a crispy little crunch, whether it be croutons, baco-bits, or a handful of seeds, can elevate a salad from merely good to truly excellent. 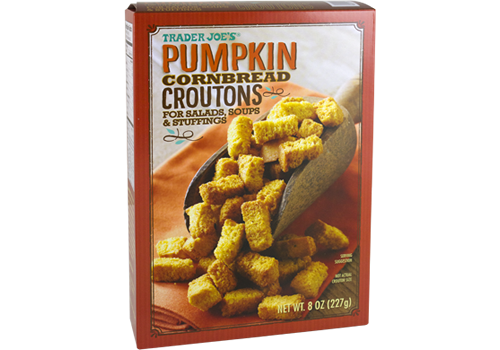 As such, I’m always on the lookout for a tasty new texture to touch up my tossed salads, and I was both pleased and surprised to see that Trader Joe’s ongoing season of induced Pumpkin Psychosis extended even so far as the world of croutons. What surprised me ever more, however, was that despite having never so much as dreamed of such an outrageous idea as Pumpkin Croutons in all my life, I had actually already made them a week earlier. That said, I did only make them by accident. 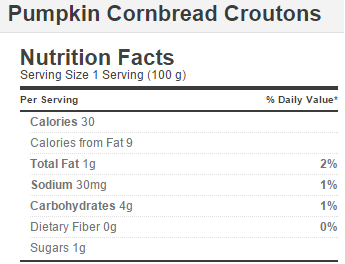 Trader Joe’s Pumpkin Cornbread Croutons are – in fact – made from the very same stuff as Trader Joe’s Pumpkin Cornbread. I rather enjoyed the cornbread, which I thought quite seasonal and tasty even if it wasn’t particularly pumpkin-y, however despite enjoying it, I didn’t enjoy it quite to the tune of an entire bread pan worth. As a result of my obdurate bachelor tendencies, the remnants of the cornbread were left out on top of the stove for two or three days. The result, I came to discover, was an accidental pan of Trader Joe’s Pumpkin Cornbread Croutons or, more precisely, just one gigantic crouton. Given the shared origin, you might expect the two to share many attributes and that is, in fact, the case. The pumpkin cornbread croutons taste a lot like the pumpkin cornbread – both are strongly redolent of pumpkin, sweetened by sugar, and spiced with traditional pumpkin pie spices. Surprisingly, in fact, the croutons are even sweeter than the cornbread. Trader Joe’s promises that each crouton is like having a bite of pumpkin pie, and while it’s not that sweet it’s not too far off either. This is a fact that makes these croutons unlike any I’ve had before. Most croutons are salty and savory, dusted with garlic, rosemary, cheese, etc. These croutons go in a very different direction, not just with the sweetness, but with the strong pumpkin flavor as well. In fact, the sweetness opens these croutons up to a variety of uses normally limited only to bread crumbs. Perhaps most brilliantly, Trader Joe’s suggests using them as stuffing for your turkey. While this is probably one of the better ideas anyone has ever had, Trader Joe’s also recommends using these naturally sweet breadcrumbs for bread pudding, or even dipping them directly into pumpkin butter. I haven’t tried any of these myself yet, and while they sound somewhat dubious, the sweet, pumpkiny taste might actually make it work out. These are the sorts of taste combinations that don’t seem like they should work at all. At least in the case of the salad Trader Joe’s actually pulls it off. The croutons are the same ones TJ uses in the very delicious Harvest Blend Salad, where they work perfectly. While there certainly are salads and salad dressings these croutons would clash with, they actually pair quite nicely with a wide variety of salad mixes – from ceasar salads, to BBQ chicken salads, to just a simple garden salad using a nice vinaigrette. Would I Recommend These: Yes, they’re surprisingly tasty. Would I Buy Them Again: Yes, if just to try out the turkey stuffing idea. Final Synopsis: Sweet and savory croutons with a variety of uses.